An interesting kind of retraction was recently brought to my attention. It seems that a professor of law had published an article in the bi-weekly Juristenzeitung on, of all things, copyright and academia. As the Passauer Neue Presse reports and the Legal Tribune online comments, this article about Open Access reproduced some passages from another legal scholar without attribution, and the university is investigating. Hmm, this is a de-publication at the publisher's site instead of publishing a retraction notice. 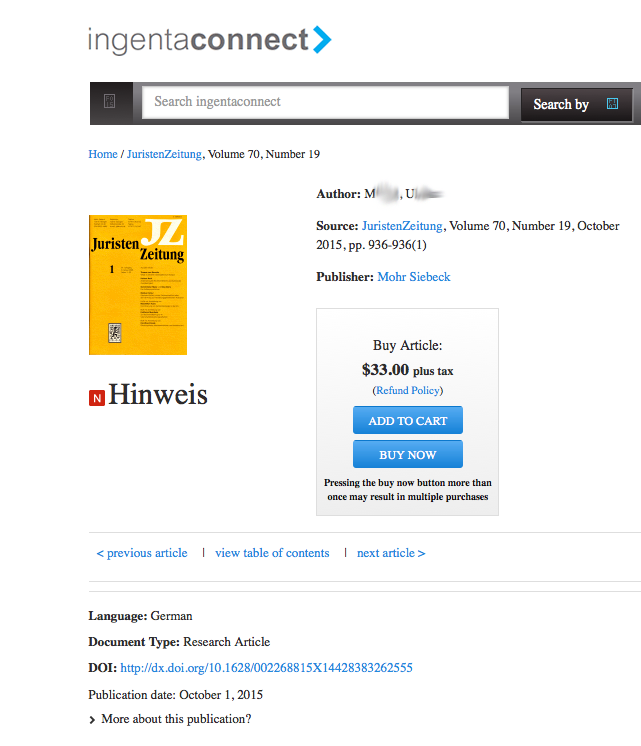 The online table of contents jumps from page 221 to page 232, the article has vanished. Of course, the abstract is still on the Juris database and at Researchgate and probably a number of other places. Do lawyers not understand that an article, once published, is now publicly available, and thus should not just disappear, but a notice of what happened put in its place? It could even have been quoted, and of course still may be, as it is in the print issues. Isn't there something also missing in the "notice"? An apology to the readers? Because they, much more so than the original writer of the text, are the ones who were misled. A documentation and discussion of the extent of the "verbatim material" can be found in the depths of the Internet. I attended the 7th Prague Forum - “Towards a Pan-European Platform on Ethics, Transparency and Integrity in Education” sponsored by the Council of Europe on October 1-2, 2015. I was invited to speak about “Plagiarism in Medical Dissertations in Germany” to the working group on plagiarism. The Council of Europe (not to be confused with the European Union) is a human rights organization that has 47 members and 3 affiliated members. In the 2013 session in Helsinki they called for a Pan-European platform to be established "to study the possibility of developing a framework instrument on the ethical principles of good conduct and professionalism for teachers. Such an instrument would as a consequence also higher the status of the teaching profession." The initiative was launched at the Prague meeting. The meeting began, after the usual ceremonies that included the Minister of Education, Youth, and Sports of the Czech Republic, with a plenary session. Christian Manquet first presented the work of the Group of States against Corruption (GRECO). Then Ian Smith and Tom Hamilton from Scotland presented their work done to the present on ethics, transparency and integrity in education. I was surprised by the use of the term "academic corruption" that seems to be the umbrella term for referring to a vast number of improper behaviors in the academic world. It encompasses not only plagiarism, ghostwriting, and falsifying data, but it also includes diploma mills, taking bribes or requests for sexual favors in an academic environment, and many other issues. By the end of the conference I was convinced that this is, indeed, the proper term, especially as plagiarism is often not just something one person does, but many factors from the environment enable the behavior and prevent detection and appropriate sanctions. The second session was focused squarely on academic corruption and included Haldis Holst, from the Global Federation of Teacher's Unions, Education International; Boris Divjak from the anti-corruption resource center U4; Muriel Poisson from the UNESCO International Institute for Educational Planning; and the head of Transparency International in Russia, Elena Panfilova. The latter gave a powerful speech with much insight. For example, she noted that Europe is facing massive migration of people from parts of the world where people expect to have to bribe officials in order to get their children into a good school. We have to explain to them that this is not how our society works [Or does it? There are reports in Berlin of security guards at the asylum application office taking bribes for good places in line...]. Panfilova noted wryly that there is much plagiarism in the theses of Russian officials, suggesting that one check the Russian Dissernet pages before shaking the hand of one and calling him or her "Dr."
One needs to differentiate not just public from private education, but particularly for-profit from non-profit entities. Financial transparency is vital for discovering ghost teachers on payrolls who get paid without teaching, ghost schools that do not exist, and ghost students or inflated student numbers given in existing schools in order to obtain additional funding. The first step is to publicly acknowledge that there is corruption as well as violence against women in education. the corrupt politicians be brought to justice. Okay, that's a mighty tall order. In the afternoon working group on plagiarism Irene Glendinning presented the results of her investigations into plagiarism policies across the EU member states, IPPHEAE. As was perhaps to be expected, there is a very wide difference of opinion on what plagiarism is, what should be done about it, and what is actually being done about it. There is an individual report for each of the EU countries investigated, as well as a summary report. She also presented her adapted Academic Integrity Maturity Model that is a tool for comparing institutions or countries, showing how mature their procedures are for dealing with academic misconduct. I spoke about medical dissertations in Germany and the plagiarism that VroniPlag Wiki has documented in over 80 cases, giving a few brazen examples. I spoke of the patterns of plagiarism discovered that can lead to uncovering academic corruption, for example chains of plagiarism found in theses by the same advisor. In one example, at the University of Münster in Germany, there is a plagiarism of a plagiarism of a plagiarism of a thesis that could possibly also be plagiarized, except that no one felt like continuing the documentation. Just the day before my talk, the university announced that it is suggesting to the disciplinary board that the professor in question have all of the perks he has been awarded discontinued and that he be reduced to minimum pay scale. That's about as far as a university can go in Germany, and to date this is only a suggestion, the final decision has not yet been reached. The first commentator summed it up rather nicely: Horrifying! It became clear that software and seminars for PhDs will not solve this problem. The theses documented are not just isolated singularities, but the result of underlying, systemic problems. Thus, radical solutions will be necessary. But first the medical community in Germany has to admit that they have a problem. There was a great discussion round after the presentations, we could have continued for at least another hour or so. The rapporteur for the group summarized the generally agreed-on points: we need to start early; involve students; set general standards; encourage professional development, but not cast rules; change funding rules from counting things to general funding for all researchers; promote the understanding that we are dealing with a public research record and not personal data; learn to respect others; understand that plagiarism is only part of the problem; encourage nations to set guidelines for quality assurance, for example as part of accreditation procedures; and strive for a holistic approach to the problem. The second day started off with a round table that first presented the results of the working groups. The working group on professional standards was concerned with how to change the mindsets of all stakeholders in the process. Promoting professionalism instead of focusing on misconduct would be ideal, but when one is dealing with a country that has slipped badly down the slope of tolerating academic misconduct, some nasty sanctions may need to be levied. The working group on recognition of qualifications looked both at the automatic co-recognition of degrees in the Benelux countries and the problems Sweden has been having with identifying diploma mills. There are issues both with faked diplomas, which are real ones with forged names on them, and fake diplomas, which are issued by a non-accredited body. They find it frustrating that students spend more time evaluating items they want to purchase than the schools they will attend. The internet platform was then officially launched, ETINED. Fighting corruption means first encouraging people to trust you and to come forward with stories of corruption. Ultimately, you want to change the community's attitude to the corruption charges. There are no quick fixes, however. He closed by noting that just because you are in a corrupt system, it is never a justification to be corrupt yourself. It was quite educational listening to the discussions between these highly educated and professional people who are dead serious about getting a handle on academic corruption. I do hope that they are able to get things moving in at least some of the member states. Update 2015-10-10: The first version of this article included an illustration with a non-medical dissertation. It has now been replaced by one from a dissertation about retinas awarded to a candidate in dentistry. Schon seit langem wird - auch von Medizinern - die medizinische Promotion hinsichtlich akademischer und wissenschaftlicher Wertigkeit stark angezweifelt. Aufgrund der in der Bevölkerung weit verbreiteten Gleichsetzung der Begriffe Arzt und Doktor hat sich eine Art akademisches Gewohnheitsrecht entwickelt, demzufolge die Verleihung des Doktorgrades weitgehend unabhängig von der Qualität der Promotionsleistungen erfolgt. Die berufliche und gesellschaftliche Anerkennung als Arzt ist in Deutschland mit dem Doktortitel verbunden. Daraus erklärt sich auch die im Vergleich zu anderen Fächern hohe Promotionsrate (etwa 80 %). Nicht selten wird der Lerneffekt bei Doktorarbeiten angezweifelt. Insbesondere dienen sie durch ihre schlechte Betreuung häufig nicht der wissenschaftlichen Grundausbildung.103 Der wissenschaftliche Erkenntnisgewinn dieser „pro-forma“-Forschung ist daher fragwürdig. The medical schools have made the occasional attempt to demonstrate that they are doing something, but by and large it has been business as usual. VroniPlag Wiki case #152 is, however, a special medical thesis. It was submitted by the current Minister of Defense, Ursula von der Leyen. One of her predecessors in office, Karl-Theodor zu Guttenberg, ended up having to step down four years ago after his doctoral dissertation in law was found to be extensively plagiarized. The press has thus jumped on the case, and is now remembering the academic grumblings about the low quality of medical doctorates. The bloggers are having a field day (Archivalia I - II, Causa Schavan, Erbloggtes I - II - III, all in German, all long). Even Spiegel has both the plagiarism documentation and a discussion of the quality of medical doctorate quality as the lead article in issue 41/2015*. The Medical University of Hannover has already announced that they have opened an official investigation into the case. I was at the 7th Prague Forum of the Council of Europe “Towards a Pan-European Platform on Ethics, Transparency and Integrity in Education” this past week, speaking on plagiarism in medical dissertations in Germany. I added a slide on case #152, as so many people were asking me about it. More on the Prague Forum in a coming post, as they have set up ETINED as a site for helping combat academic corruption. * although they demonstrate in the article that they don't understand Creative Commons licenses. CC-BY-SA means that you name the source and put the result, if you reuse or modify it, also under such a license. They changed the color of a bar and reformatted it to fit, and then slapped a "Der Spiegel" copyright on the picture.